John Coltrane is the most influential tenor saxophonist in jazz history. Whether it's his patented "sheets of sound," his rapid-fire improvisations or his bold cathartic wails, no aspiring jazz saxophonist can afford to neglect the music of Coltrane. 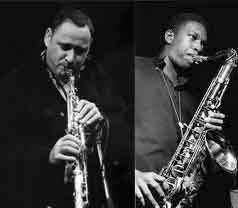 Tonight, the great saxophonist Gilad Atzmon will take to the stage for the ultimate interpretation of one of the greatest jazz musicians! A celebration of the great man’s music. "A formidable improvisational array...a local jazz giant steadily drawing himself up to his full height..." – John Fordham (The Guardian). Soho Interpretations: Pizza Express is delighted to announce a regular series of Monday night shows featuring the Jazz Clubs greats interpreting the music of Jazz Legends. Artists will come together for concerts that lovingly pay homage to their heroes. The legends in question have created some of the most innovative and expressive music in Jazz history and these shows will show case their music by some the current crop of leading Jazz artists.